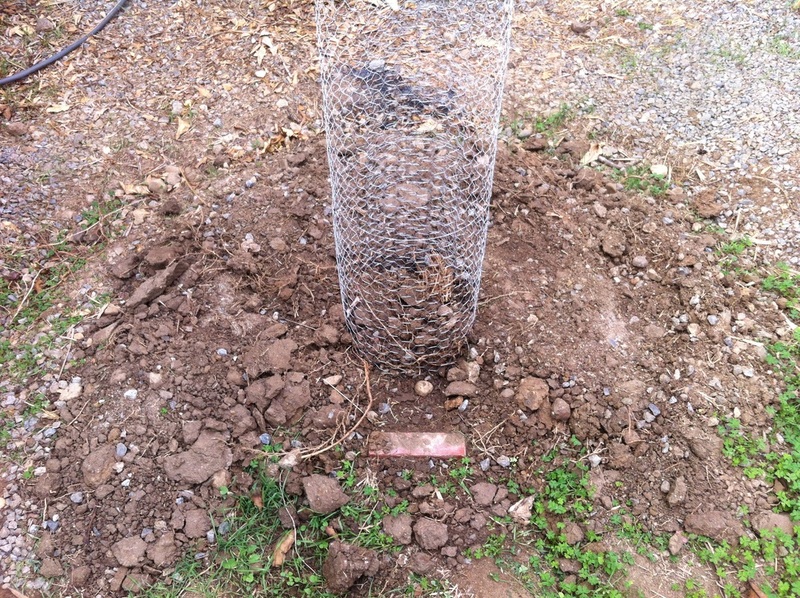 Not too long ago I started reading a lot about composting keyhole garden beds. Apparently this technique has been used successfully in locations that are prone to both drought and torrential downpours. 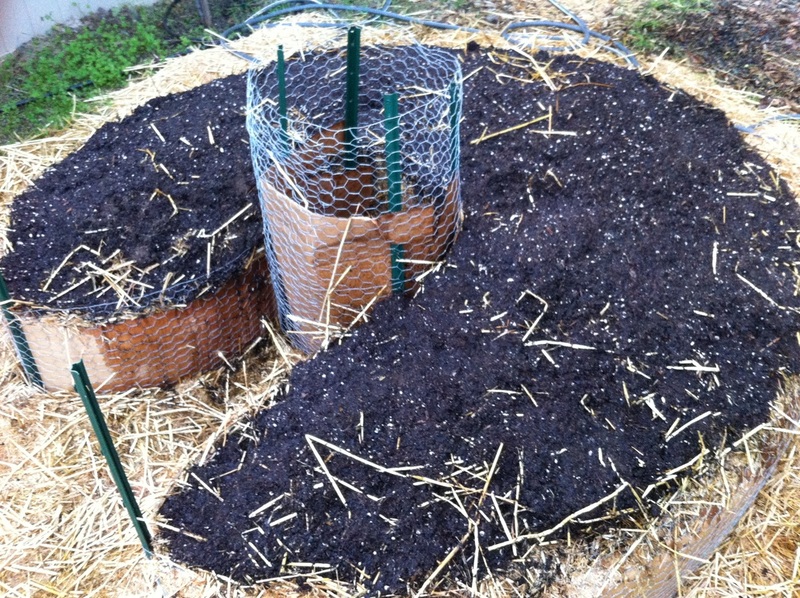 Basically it is a circular raised bed with a column for compost and worms in the center and a pathway for walking toward the central basket. As water and food waste is added to the central compost area, worm activity moves nutrients into the surrounding garden bed. To get started I jammed three bales together and shortened the central one a little so that together they roughly filled out a circular area. 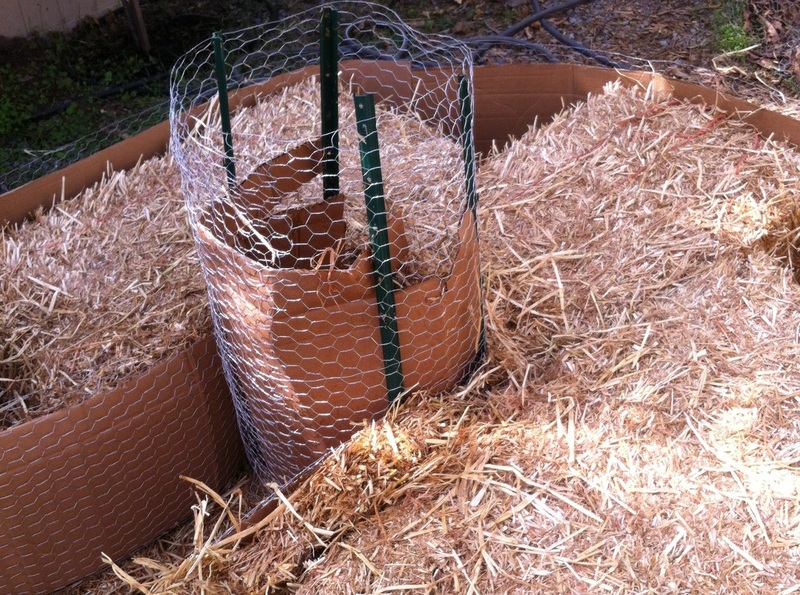 Then I wrapped the bales in chicken wire and lined the wire with cardboard. There were gaps left between the bales and the cardboard walls and I shoved as much straw into those gaps as I could. Then I cut the strings of the bales and there it was--an over-sized circular straw cake! had not pulled my fingers out they would have been burned! Wow! I knew that compost got hot and had even seen it steam, but somehow it surprised me yet again. I needed to wait a few weeks before planting, but in the meantime I started filling the compost column with layers of straw and juicer pulp, and some red wiggler worms to get things going. composting keyhole technique with the straw bale raised bed technique. There were several reasons for this, the first being that the straw was readily available. But also, since there is a utility easement in the alley, permanent improvements are frowned upon. In a year's time the straw bales would likely become compost, which I could then spread around the plants. 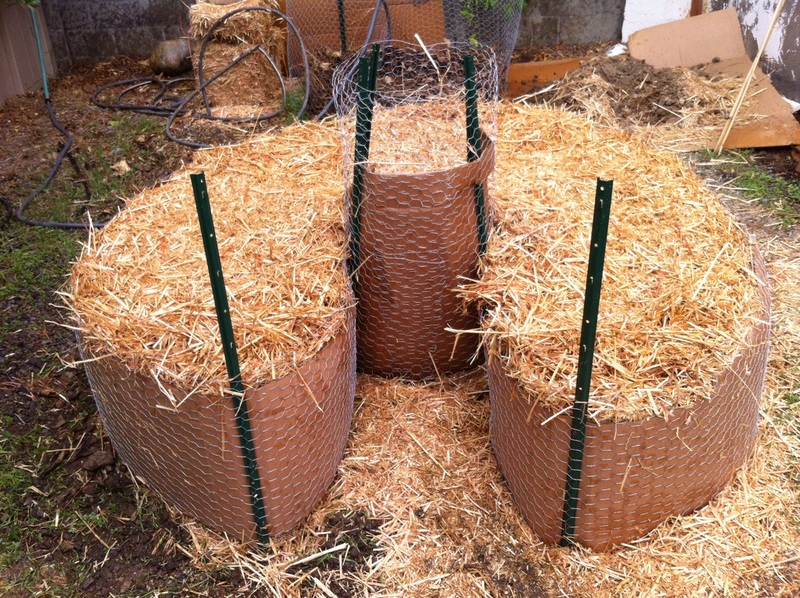 And if I wanted to, I could always make another straw bale composting keyhole garden bed. I sprinkled some fertilizer on top and watered it thoroughly. A few days later I covered it with soil and watered some more. Then I more or less forgot about it.